Guacamole is one of my favorite dips. Up until even a couple years ago I didn't like it, but I'm so glad that my taste buds have matured, because it is sooo good on, well, everything! By the way, after you make this guac dip, you could then use it in this yummy layered Mexican dip! Chopped tomatoes – however much you'd like. If they're in-season I like a lot since they taste so good that time of year. Otherwise I might just add some salsa. Stir it all together, mashing up the pieces of avocado a little as you go. Always taste-test of course, to see what you think it needs, that's the fun part. I hope you love this quick and easy guacamole recipe, too! —Hey, you low-carbers! What do you use to dip into your guac? —Tortilla chips – I usually get the organic kind so I know there is no GMO corn in them, and no trans fats or other junk. —OR you can do what I did this time and it was a big hit. Our pastor, Father Tony (a rock-solid awesome pastor, by the way), gave me this tip: use some whole wheat pita bread as a dipper! The ingredient list on the kind he suggested was very short with no trans fats or HFCS, the only icky thing was one preservative listed as the last ingredient, not bad as ingredient lists go. To make it even better: spread some soft butter on both sides, then broil in the oven until golden, flipping once (watch them or they'll burn…trust me), and cut into wedges with a pizza cutter. YUMMMMMMMMM, thank you Father Tony! I love guacamole with carrots. I also make a tuna sandwich with some guacamole on top. I love guacamole too, but I always loved the crunch of the chips. So I heard somewhere about PORK RINDS, found in the chip department of the grocery store. Now I still have the crunch with 0 carbs! And they actually taste almost as good. What a great idea, I’ll have to try that! We eat our guacamole on burger, preferably also with grated cheese and a few black olives, or with any Mexican/spicy food. Most days we have plain sliced avocado with our breakfast cheese omelette, but guac is good with that too. It’s our low-carb “huevos rancheros.” My husband puts salsa on his omelette too. I never put citrus, cilantro or mayo anywhere near my avocados. No onion, either. It’s easy to overdo the tomatoes. I use only “California” avocados, although now they come from other countries as well. Florida avocados, the big green ones, are too watery and taste bad. I’m already a reader/subscriber to your blog, but I thought you might like to know that I found this post today because you were one of the first posts that came up when I did a Google search for guacamole! How cool is that? Anyway, thanks for the recipe. And as a low-carber, I usually like to dip bell pepper squares into my guac, but today, I’m actually mashing it up with the yolks of hard-cooked eggs to make these Fat Guacamole Devils featured at Mark’s Daily Apple. Tracey, you’re so sweet to tell me that! I just tried and wasn’t on the first page, but didn’t check to see how far back it shows up. Well, I know that Google can be user-specific based on your search and browsing history, so that might have had something to do with it, but for me, when I searched “guacamole”, after the first couple of links, there were a strip of pictures of guacamole from Google Image Search. I clicked on the one that looked the prettiest and most appetizing, and it just happened to be yours! Anyway, I used the basics of your recipe and combined it with this guacamole-egg idea and it tuned out delicious! I blogged about it today ( https://unbreaded.blogspot.com/2010/08/new-twist-on-green-eggs-with-or-without.html ). Hope it’s okay that I linked to you! Fry a serving of ground meat (I use venison, but really any meat would be fine), seasoned with salt (or try what you like). 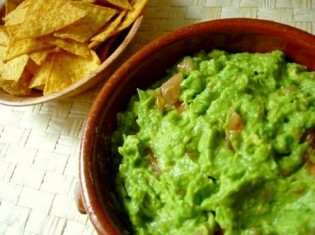 Place a large serving of guacamole in a bowl and top with the meat. Makes a great easy main dish. I know it doesn’t sound very good, but somehow it is. We put chopped fresh tomatoes in our guac, so if you don’t, this would be a nice addition with the meat. Crispy nuts also go with guac if you can’t eat chips. I never liked guac either until I was looking for a dip that wasn’t “dangerous” for my health/diet. I also use veggies instead of crackers or chips. Love the crispy pita idea. Naomi, to answer your question: I’m an “on again off again” low-carb eater, but because of this it’s always on my radar these days, and I eat a lot less carbs/grains than I used to. I always love getting new ideas for alternatives – some of them are so yummy that I don’t even miss the carbs! Penzey’s Spices has an Adobo seasoning that makes the best guac — just a generous shake of Adobo and a squeeze of lime juice, and you’re done. Mmmm! I just made a batch of these olive oil crackers (https://www.101cookbooks.com/archives/olive-oil-crackers-recipe.html ). They remind me of pita chips I have had before and I was just trying to think of a good dip to make to go with them. This sounds perfect. Thanks. This is my favorite way to make guac, too! So much easier than cutting up tomatoes, onions, cilantro, etc. I just add salsa, salt, and pepper. Yummy! I love guac plain with maybe just some onion chopped into it, or sea salt. It seems that the more stuff I add to it the less avocado taste there is. My fave dipper is corn chips but that’s one of the highest carb grains there is, according to reports I read. I keep wondering, if you are eating a low carb diet, how you figure grains to be low carb? Are you maybe just speaking relatively or something? This is what has made my low carb diet so difficult, cutting out grains and beans. These were the foundation of my diet before. Anyway, thanks for all you do Kelly. I get quite a lot of good info here and I appreciate all your leg/finger-work! If I can’t have it on delicious flour tortillas, then I’ll just eat it with a fork. Seriously, it’s so unadulterated that way. Not low carb but I love avocado sandwiches. I put slices on bread with mayo. This would be even better! I also cut up and put avocado in my daily broth for a filling low-carb lunch whenever I have some (unless you crack some spaghetti noodles into it like I do). They were on sale 3 for $1 last week and I meant to go back and get a ton but didn’t make it :(. I love to dip veggies in my guac! Same with hummus too. I’d dip a spoon in mine! Or use it on a big Mexican salad. for low carb we either eat the guac in a big salad or I dip celery and cucumber slices into it. Yum. Mmmm. We love guacamole in this house. For a low carb way to eat it, we don’t use dippers at all. We spread it on a large lettuce leaf and roll it up. Kinda like a Mexican lettuce wrap instead of an Asian one. Very tasty this way. 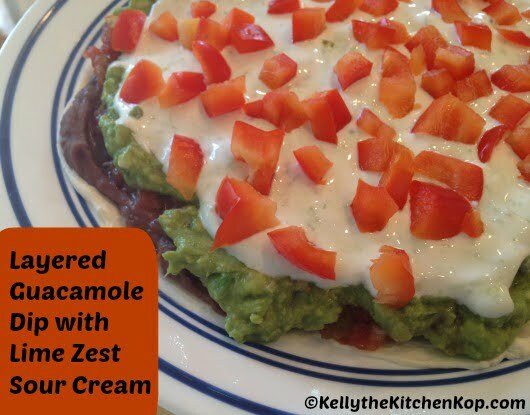 It also makes a great topping for any Mexican-inspired meats.